Although the original peoples that worshipped the Morrigan have been in the ground for centuries and are long since dust, that is not the same thing as saying that the goddess herself is gone. Indeed, she has never truly been gone, but over the last year or two, there has been a veritable explosion of new reverence for this complicated and primal goddess, so much so that it might be said that 2014 was — and 2015 will be — the Year(s) of the Morrigan. Rituals, prayers, and even conferences to the Morrigan have abounded in the last couple years, and it seems likely that the continued interest in, and love of, this particular goddess will only continue to grow in the months and years ahead. Author Morgan Daimler, a devotee of the Morrigan for a decade and a half, has written an excellent book for those wishing to get to know the goddess. Part of Moon Books‘ Pagan Portals series, it packs a wealth of both well-researched, footnoted lore and personal experience into its 79 pages. Daimler starts by pointing out that the Morrigan is both a single deity and a group of goddesses, each with their own name and role. She delves deeply into each goddess’ original mythography, noting where it is incomplete or conflicting, and relating additional information that has been gleaned from archaeological discoveries. 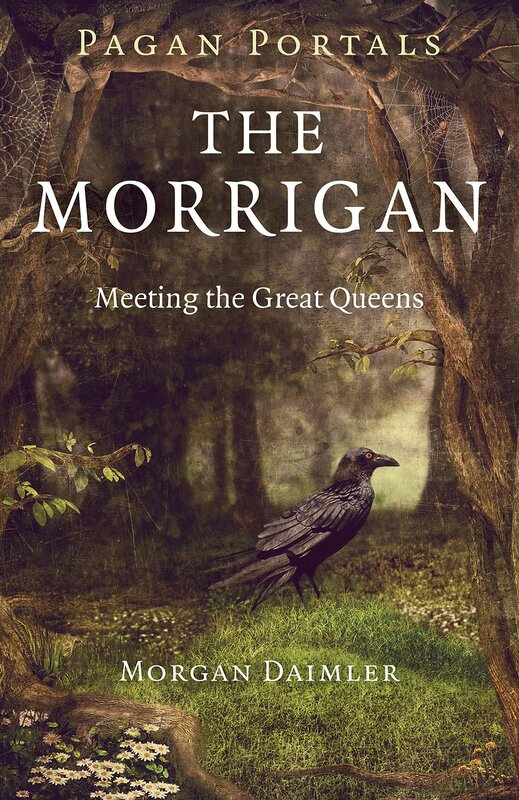 The book’s seven chapters do an excellent job of discussing the historical material on the Morrigan, the associations each of the goddesses of the Morrigna have, and very carefully discuss the often-conflicting lore (for example, there are no less than five different and important individuals in Irish lore bearing the name Macha). Most pagans and polytheists who are at least minimally familiar with the Morrigan know her as a goddess of blood, battle, and death, but there is much more to her than that. The ancient Irish knew her also as a goddess of sovereignty, of prophecy, and of magic, and more than one locale in Ireland bears a place-name linking it to the Morrigan. The book also discusses the animals commonly held sacred to the Morrigan; ravens and crows are best known, of course, but horses, eels, wolves, and cows are also considered hers. Daimler also takes the time to address each of the known names and roles of the Morrigan, usually explained as a triple goddess. The goddess Morrigan herself, Macha, and Badb are the trio of deities that are generally considered to be the Morrigna, the trio. However, Daimler also discusses a number of other goddesses that have been considered to be among the Morrigna in the past, describing the lore and attributes of Anu, Aine, Nemain, Fea, Bé Neit, Danu, and Grian. But the book does not deal only with historical lore. Daimler’s own devotion to the Morrigan is well-represented here with poems, prayers, and anecdotes, and the book’s final chapter deals with the Morrigan in the modern world. Her mastery of the information shines through with every page, and her passion for the goddess is equally apparent. Like Daimler’s previous work with Moon Books, Fairy Witchcraft, Daimler supplies plenty of material at the end of the book for readers who want to delve deeper, in the form of endnotes and an ample bibliography. (There are also in-line notes throughout the text, as most of the notations are in APA format.) Although there are a fair number of pagan books that include the Morrigan among other goddesses in a general discussion of female deity, Pagan Portals: The Morrigan is one of very few of those that deals with the Morrigan alone. That, and this work’s excellence, make it well worth the price of purchase, and I predict that this will be a book that followers of the Morrigan will refer back to again and again.